What is Property Loss Consulting? William Godfrey, a Project Engineer in the DeSimone’s Chicago office, gives an overview of the firm’s Property Loss Consulting practice. Property Loss Consulting (PLC) is defined as the practice of assisting property owners, insurance companies, insurance adjusters, or attorneys in evaluating and understanding the scope, nature, and potential exposure to losses related to natural or man-made events. Generally, PLC services can be broken into two groups: pre-loss and post-loss services. Pre-loss services may include analyzing the effects of extreme loading and other adverse conditions on existing buildings and structures, analyzing potential risk exposure, and assisting our clients in determining ways to mitigate exposure to risk before a loss occurs. Post-loss services include the investigation and analysis work performed after a loss occurs. We can help determine the cause/origin and the scope of damage from a loss event. Our team can provide stabilization and/or repair recommendations and details. DeSimone will guide and advise with respect to building codes and regulatory obligations, providing our clients with independent evaluations of requisite and event-driven code compliance, along with recommendations for achieving compliance, when required. 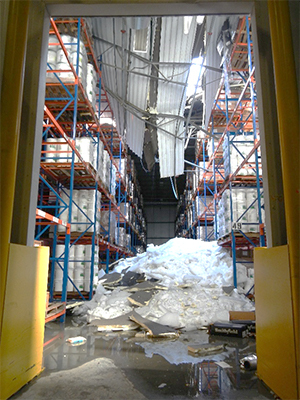 Partial roof failure of temperature controlled storage facility, Indiana. DeSimone was retained by a law firm representing an insurance company pursuing subrogation litigation related to a partial failure of the roof structural system of a 230,000sf temperature controlled storage facility. DeSimone was tasked with providing an opinion on the root cause of the failure. This project entailed reviewing thousands of documents provided to DeSimone during the discovery phase of the underlying lawsuit including the original structural design calculations, construction documents, and deposition transcripts of other parties, creating a finite element model of the roof systems to study its behavior under various loading configurations, preparing an extensive report documenting our factual findings and summarizing our professional opinions, assisting our client in the development of technically based deposition questions, and providing expert witness services. View from sUAS showing the unique perspective impossible to achieve with traditional inspection methods. DeSimone was retained by a large international adjustment firm to provide a damage assessment of several buildings encompassing roughly 30,000sf of habitable space damaged by Hurricane Matthew. This project entailed several site visits to inspect the buildings and the preparation of a report documenting our factual findings and summarizing our professional opinions. 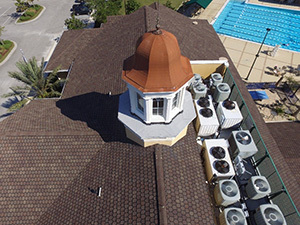 This project was notable in that it was the first project in which DeSimone utilized the use of a Small Unmanned Aircraft System (sUAS) to assist with the survey and documentation of the roof surfaces of the buildings.